First off, I'm new here and am looking forward to posting. I live in Leigh, Lancashire, and am currently researching into the Shaws of Ashton-under-Lyne a family which made a significant contribution to the wealth of my home town. For those who don't already know, brewer William Shaw (1822-1889) was invited to manage Leigh's Bedford Brewing & Malting Co. (BBMC) in 1883. Essentially, William was already a successful brewer in his home district and BBMC was in financial trouble. Thankfully, William accepted the invitation and later took his son, James (1848-1880), with him to Leigh to assist him and later still, also took his younger son, George (1860-1918). Although William died in 1889, BBMC's fortunes had been turned around and George took over from where William had left off, James having died in Leigh in 1880 at the young age of 32 years. George wanted expansion and set about buying out a number of local breweries until, essentially, the Shaw Brewery monopolised brewing in Leigh. George continued the excellent work started by his father and, in 1902, changed the name of the brewery to Geo. Shaw & Co., Ltd. From 1902 to 1910 (approx. ), the renamed brewery was almost completely rebuilt and employed a substantial workforce. George became involved in politics and became the second Mayor of the recently chartered Leigh Corporation for the period 1900/01. By now a very wealthy man, he resided at one of Leigh's finest house, Pennington Hall. When he died in 1918, Pennington Hall and its substantial grounds was bequeathed to the people of Leigh for use as a public park. Sadly, it fell into disrepair due to lack of council maintenance and the Hall was demolished in 1963. On George's death in 1918, his sons, William (1889-1937) and Frank (1891-1949) took over the running of the brewery but they clearly didn't possess the business acumen of their father. An attempted takeover of Sharman's Brewery (Bolton) some time around 1927 placed Shaw's Brewery into financial difficulty and this ultimately resulted in the sale of Geo. Shaw & Co., Ltd., to the Walker Cain brewing conglomerate in 1931. The building continued to be used by Walker Cain, mainly as a distribution centre, until around 1966 (by then owned by Tetley Walker) and was demolished in 1998 to form a site for new houses. If you're still awake , although I have considerably more information on this subject, I also have some notable 'holes'. In this respect, I was hoping that some of the good folk on here might be able to assist me. Some of the Shaw clan remain quite mysterious in that little seems to be recorded of them on Ancestry.com. This isn't helped by the habit that some of the Shaws had of changing their names! Eric Shaw of Dukinfield is referred to in four Leigh newspapers as attending family events in Leigh. These were in 1904, 1912, 1918 and 1920. He was described as the nephew of George Shaw. He was also listed as a lieutenant away on active service in 1918. I cannot with any certainty trace his birth or death details. A second family member, Joseph (Lockwood) Shaw (1850-), brother to George, disappears from the record after his final census return in 1891. I believe that he married Harriet Ann Jones in Ashton-under-Lyne during 1888, but I cannot trace his death. One more for the minute...William (another of George's brothers and son of the William who first came to Leigh in 1883) was born c. 1853 in Ashton-under-Lyne and married Rachel Walker in West Derby, Merseyside, in 1882. Again, I cannot trace a death date. It is known that some Shaws did emigrate (e.g. Henry (Harry) Lockwood Shaw moved to South Africa in the 1920's). I would welcome any information you have on these three chaps and anything remotely related to the Shaws. Would also like to trace the location of Bank Top House, Ashton-under-Lyne, the home of Ashton & Leigh brewer, William Shaw (1822-1889), for the latter part of his life. Is it off Currier Lane near to where 'Bank Top' is now? Bank Top House was at the end of Currier Lane at Scotland Street. On Familysearch, there was a christening for an Edward Lockwood Shaw in 1850 St Michaels Ashton under Lyne parents are given as William Shaw and Jane. Thanks, Heather. I will try to find whether this new information slots in to what else I already have. The family born in Dukinfield were the children of William Shaw a nail maker born Stalybridge and Jane Shaw from Denby Dale. Jane died between 1851 and 1861. Thanks for doing some digging, heather, I'll look through your findings in more detail later today. There were lots of William Shaws in the Tameside area at the end of the 19th. C.. The William Shaw marriage you noted (Marriage: 11 Jun 1882 St Jude the Apostle, West Derby, Lancashire, England - William Shaw - 32, Brewer, Bachelor, 29 Walker Street/Rachel Walker - 26, Spinster, 12 Newton Street) refers to the William Shaw who seems to disappear from the record after the 1891 Census. This is certainly the family I'm researching. In my search to learn more about the Shaw brewing family of Ashton-u-Lyne, I traced William Shaw (1822-1889) in the 1851 Census as living at The Red Lyon, Stamford Street, A-u-L, employed as a beerseller and brewer's traveller. 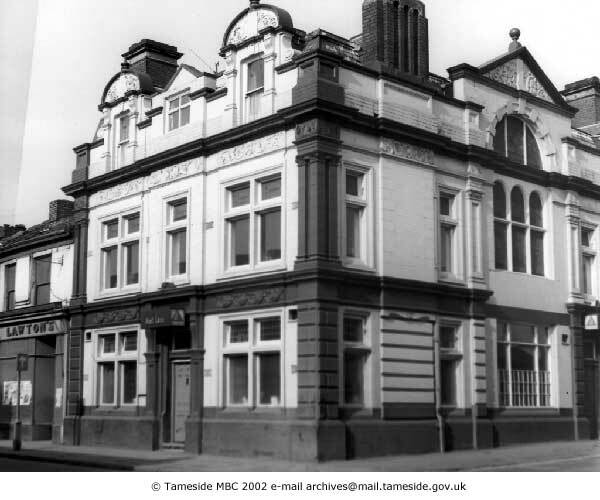 In A History Of The Breweries Of Stalybridge, Dukinfield & Hyde (B. Sullivan, 1996) it expands on this thus, "....in 1850 he [William Shaw] became the licensee of the Red Lion public house on Stamford-st. in Ashton-under-Lyne. 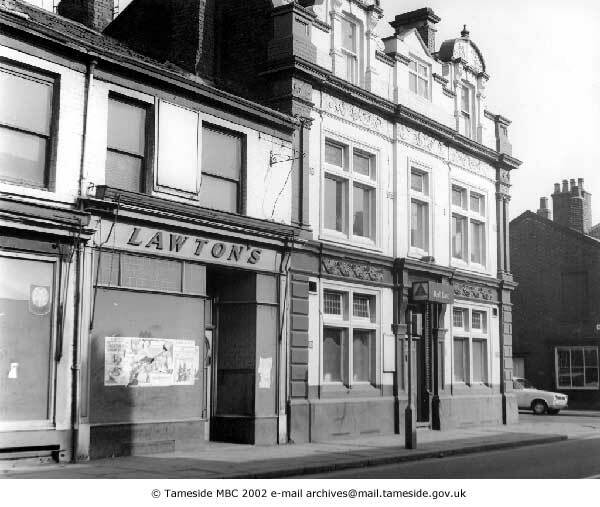 It was here at the Red Lion that he commenced brewing on a small scale in premises that were situated at the rear of the public house..."
Trying to find out more about the Red Lyon/Lion, I referred to A Directory Of Ashton Pubs And Their Licensees (Rob Magee, 1989). Sadly, he makes no reference to the Red Lyon/Lion in the alphabetical listing. Has this pub ever been known by another name? What a strange omission. It should be between the Red Bull and Ring'O'Bells It's on the inside back cover number 93 . One of the anomalies in Magee's Directory is the use of later "trendy" names to long established pubs. "Witchwood" is a prime example. Thank you, Ashtonian54, for pointing out the name change and for the photographs. I too am surprised at Magee's preference for the latest names. You mentioned that the pub closed in 1989. Based on Google Earth's Street View, the building is no more. Have you any idea when it was demolished? ?